Just imagine 1 ½ acres of sprawling lawn, fabulous shade trees, spectacular sunsets, surrounded by the majestic vineyards of the Fresno countryside. Now imagine you and a few hundred of your closest friends on your special day. Now you don’t have to imagine it you can live it, at Engelmann Cellars. 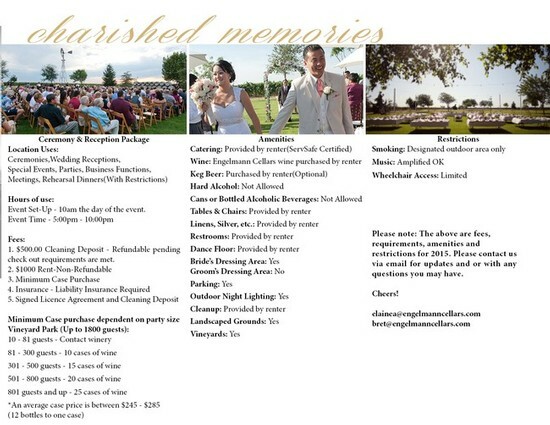 Engelmann Cellars Vineyard Park, and Vineyard Pavilion located directly behind the winery is perfect for weddings, family reunions, special events, etc. Rent of $500 plus a minimum wine purchase is all you need to reserve your spot, then you can bring your own planner, caterer, band, dj, or have us have us help you with recommendations of people we have worked with. Please check calendar below for availablility. The winery will still be open for wine tasting from 12 - 5 PM every Saturday and Sunday even when marked as Booked Not Available. Please indicate your prefered date when contacting the winery for more information. This Calendar shows dates that may still be available to have an event at Engelmann Cellars. This is a tool to help you plan your event but dates shown as available are not guaranteed until confirmed by the winery. For availability and reservations e-mail info@engelmanncellars.com or call 559-274-WINE(9463).